Entertain your guests at Family Fun Center of Lakeland! Wondering what to do with your out-of-town guests this holiday? Merry Christmas and Happy Holidays from your friends at Family Fun Center of Lakeland, Florida! We hope you are staying sane and grounded this holiday season. Regardless of how you celebrate this season, there is a good chance you will be entertaining out-of-town guests at some point this year, and we understand the challenge of having little ones, be they cousins, nieces or nephews, or even your own children that get bored. We have the perfect solution for all of the people who are looking for activities while you prepare the holiday meal, or the house…take a break and come to Family Fun Center of Lakeland! There is literally something for everyone with us! Not only is our weather sheer perfection, even in December, but your guests will be entertained for hours! Take a look at some of our attractions! Adventure Golf: This fun minigolf course is great for any age! Dads will love showing their little ones how to “properly” putt a ball, moms will enjoy watching their children learn new things, and kids will love getting fresh air and having a blast! Funtasia Play Area: This fun jungle gym type structure is perfect for your littlest children. This four-story maze of tunnels will keep them entertained for hours, and will be a great time for you to enjoy some time to think! While we require that you monitor your children at all times for children under three, it is a great time to clear your head and decompress amidst the holiday stress. The Vault Assault Laser Maze Challenge: This is one of our newest attractions, and it is sure to delight! This fun challenge allows your child to pretend he or she is a spy, navigating through laser beams as they engage their imagination! Still need that perfect gift? 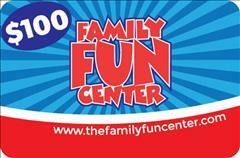 How about a gift card to Family Fun Center?